Recorded by The Clancy Brothers And Tommy Makem- Written by Francis McNamara, The Irish version is the one I have put chords to. The sheet music and tin whistle notes are included. There are at least thirty six versions that I have come across while researching this song. Also recorded by Dr. Hook, The Irish Rovers and Mick Jagger from The Rolling Stones. The song featured in the movie The Quiet Man by John Ford. It was sang in the pub about 10 minutes into the film with a man playing the accordion. Also recorded by Robbie O'Connell. From dusk to early dawn. He was inclined to roam. And a heart that knew no fear. He sang a merry song. "You see there's three to one! You are a plundering son!" Of poor but honest parents he was born in Castlemaine. O, fondly did his parents love the wild colonial boy. Together we will plunder, together we will die. For we scorn to live in slavery, bound down with iron chains. But never an iron on earth could hold the wild colonial boy. With a loud shout of defiance, bold Donahoe broke clear. But no trooper in the land could catch the wild colonial boy. From out the thick Bringelly bush the horse police did ride. "I'll fight this night with all my might!" 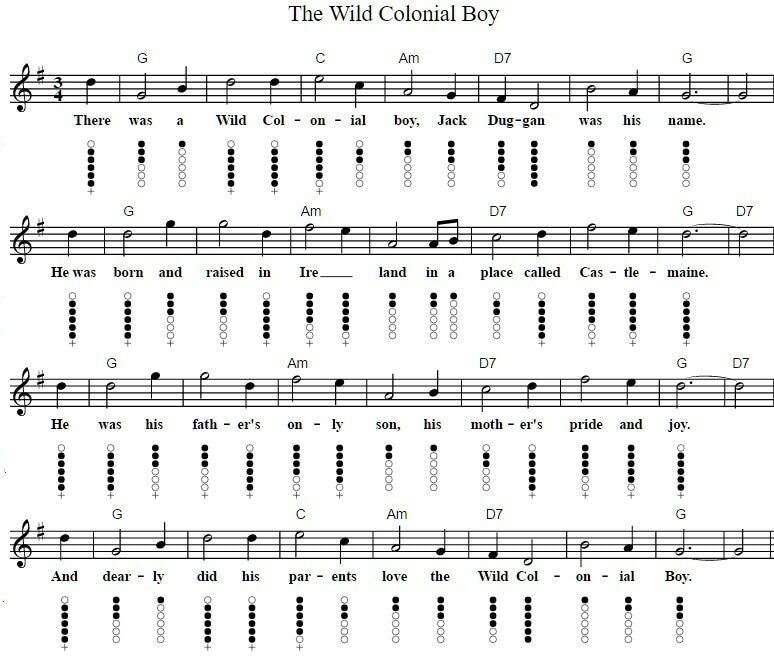 cried the wild colonial boy.!" Crying, "Parents dear, O say a prayer for the wild colonial boy." And dearly did his parents love that wild colonial boy. And a terror to the rich man was the wild colonial boy. And thought that they would capture him, the wild colonial boy. Surrender now Jack Donahue, you daring highway man!" "I'll fight but won't surrender", cried the wild colonial boy. And dearly, dearly did they love this wild colonial boy. Before we'll die in slavery, bound down by iron chains. And a terror to-Australia was the wild colonial boy. Who rode up and tried to capture him, the wild colonial boy. Surrender in the Queen's name for we are three to one". Saying "I'll fight but not surrender, I'm the wild colonial boy!" And that was how they captured him, the wild colonial boy. For seven long years in New South Wales to wear a convict's chain. For we scorn to live in slavery, bound down in iron chains. These were the true associates of bold Jack Donahoe. And when they came to call the roll they missed Jack Donahoe. Concerning this dauntless hero the bold Jack Donahoe. And called aloud on Donahoe to fight or to resign. Than work one hour for government", cried bold Jack Donahoe. Saying, "Convicts all, both large and small, say prayers for Donahoe". He'd scorn to live in slavery or humble to the Crown. Was banished for his natural life from Erin's happy land. It's there they titled him the brave and bold Jack Donahoe. When he took to the highway, as oft he had before. These were the four associates of bold Jack Donahoe. And in quick time they did advance to take Jack Donahoe. Come, come, you cowardly rascals, oh do not run away! Than work one hour for Government," said bold Jack Donahoe. I see they're still advancing us ~ their number's more than three. And if we wait we'll be too late, the battle we will rue." "Then begone from me, you cowardly dog," replied Jack Donahoe. And called aloud to Donahoe "Will you fight or resign,"
For today I'll fight with all my might," cried bold Jack Donahoe. Till the fatal ball had pierced the heart of bold Jack Donahoe. Saying, "Good people all, pray for the soul of poor Jack Donahoe". With Donahoe this highwayman none of them could compare. May the Lord have mercy on the soul of brave Jack Donahoe.